Drs. Curatola & Zagami (New York) - Book Appointment Online! Midtown Manhattan Dentists Dr. LuAnne M. Curatola and Dr. Joseph Zagami practice a full scope of general and cosmetic dentistry with expertise ranging from dental implants, crowns, porcelain veneers and teeth whitening, Invisalign® clear braces. Drs. 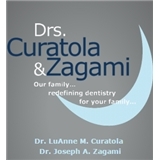 Curatola & Zagami can correct a wide variety of so-called permanent cosmetic dental problems, and can literally redesign your smile. Our office is located at 330 West 58th Street, Suite 605, New York, NY. Dr. Curatola was amazing!! I would highly recommend this dentist to anyone.